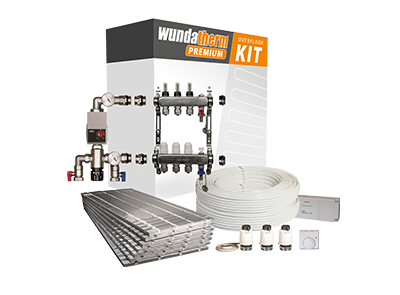 Complete multi zone underfloor heating kit including 20mm low profile Wundatherm Premium Overfloor Boards, 16mm Pert/Al/Pert Pipe, Premium Manifold, Controls, Wunda’s Premium Pumpset and Wilo ErP Pump and an option for a Grundfos EuP Pump for £12 extra (£10+VAT). This kit features Wundatherm Premium Overfloor heating boards that are 200 kPa strong and factory fitted with 100 micron aluminium for fast heat in all modern homes. 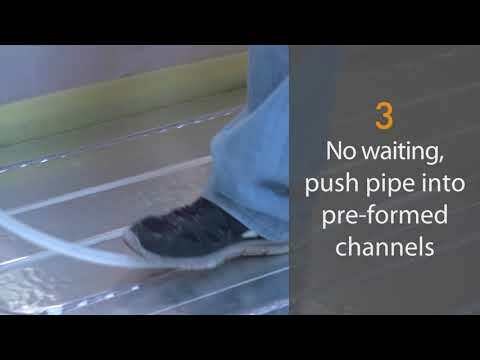 Low Profile Wundatherm Premium Overfloor Heating Kits are the perfect choice for Installers wishing to install a floor heating system with no need to dig up floors or wait on wet trades. Perfect for laminate & wooden floors as well as being suitable for carpet & vinyl when using an intermediate layer. Wundatherm Premium Overfloor heating boards are simply stuck to the existing floor using our strong, rapid dry panel adhesive Multi zone kits are ideal for heating separate areas with individual thermostats, simply add more thermostats as required. Each kit is designed to cover up to its maximum M² area with overfloor panels using Wunda Pert/Al/Pert pipe at 150mm spacing. All kits feature 16mm Pert/Al/Pert high output pipe which contains an aluminium barrier, preventing oxygen diffusion through the pipe walls. Wundatherm Premium 20mm Overfloor boards are bonded with 100 Microns thick Aluminium for fast heat up times in all modern homes. Our multi room kits come with a mechanical thermostat, wiring centre and actuators as standard. 100 Micron - Heats modern homes in 40 minutes.